The way copyrights have been set up is that the rights that are granted are good for a number of years past the author’s death. Creative works are generally thought to be created by real people. It wouldn’t make sense in a macabre way to have these rights terminate when the author dies, since they can be quite valuable. On the other hand, another motivation for such a rule is also presented: this way artists can provide for their family and children after their death; the heirs inherit the copyrights and can enjoy some income from the license fees for some definite time after. Many careers, types of work, and businesses are like that: an “asset” is built up over time, which can be passed on independently of who started it, with much effort, presumably. So a taxi driver might pass on their business when they cannot work anymore, or a plumber. For the taxi driver, the asset would be the business licenses and the car, for the plumber mostly the list of clients, possibly the store. It’s not completely fair, in a way, since a bus driver wouldn’t have much to pass on, or a teacher. Nevertheless, you could agree that artists should have something similar, although it is still difficult to make it work, see this techdirt article, Rethinking Handing Copyright On To Heirs Beyond Death, for example. Now, one of the annoying things in the world of copyrights is that governments keep extending the terms (US, Europe). When I buy let’s say a book or music CD, it comes with copyrights, and these rights are set to expire. At the time they expire, my heirs will have rights with regards to the book or music CD. Be it to publicly perform the work, to reproduce it, distribute it, or create derivative works. All those rights are taken away by these extensions! I walk my daughters to school, once or twice a week (my partner takes them on the other days). It’s ten blocks. They wake up early, so it’s mostly a stroll, no rush; about ten blocks through the quiet side streets. On the way back I take a different route, along the busy Hastings Street in East Vancouver. Three times in the last few months, an accident happened at the intersection with Kamloops Street. Car crashes. The first one was while I was at the intersection, talking to a friend at the traffic light. Hastings Street goes from left to right in this picture, and Kamloops from the top to bottom-left; top is South, right is East. The “other car” had already been moved out of the intersection. Here’s a Streetview link. I don’t know if anyone was hurt. There was an ambulance, but no movement around it. All three accidents happened when the 3-lane traffic along Hastings is stopped through a traffic light, so that pedestrians can cross, and cars can cross that are going along Kamloops Street. 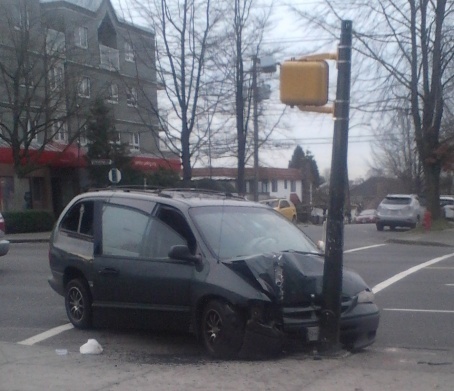 The cars coming from Kamloops/South collide with cars going East on Hastings. Either the Kamloops cars cross too early or too late, or the Hastings cars ignore/fail to notice the traffic light. I don’t really know. Now with passing this intersection twice a week over ca. 12 weeks (school started in September), and coming across 3 accidents, it seemed to me the other 3 days of a week should generate the same number of accidents, so it would come to 3 (accidents) * 3 (other days) / 2 (“my” days) = 4.5 “other accidents”, for a total of 7.5 accidents in ca. 3 months. Statisticians will probably point out that this is not a good estimate. But let’s make it 7 accidents in 3 months, or 7 *4 = 28 accidents in a year. It displays accident counts by intersection for the City of Vancouver, for the years 2006 to 2010. He obtained the numbers from the Insurance Corporation of British Columbia (ICBC) – who get the reports from the police. Now my calculation from above looks spot-on: I estimated 28 accidents for 2011, and there were 27 recorded for 2010. But all accidents that I counted occurred around 9 o’clock in the morning, since I was walking home from the school. Do the accidents at the intersection of Hastings and Kamloops Street occur mostly around 9 o’clock? Do the morning accidents at the intersection of Hastings and Kamloops Street occur mostly when a car crosses from the South along Kamloops, and the other car is going East on Hastings? Do intersections with a similar number of collisions have anything in common? What kinds of commonalities? Does it make sense to blame the accidents only on the individuals involved? Does the City of Vancouver track this data and analyze for prevention? Does the City of Vancouver carry any responsibility? What aspects of an intersection can be improved? How many hours of additional driver training reduce the number of accidents by how much (regular training, one-time training)? How many km/h of speed limit reduction result in which reduction in the number of accidents? About point 3: due to the large numbers of existing collision-prone intersections, and the predictability of collisions occuring, if indeed commonalities exist then one can try out different strategies to lower the numbers, and compare what works and what doesn’t, for example with A/B Testing. Better than doing nothing (my impression). Especially if you think across several cities. I’m not aware of this happening. Another friend of mine pointed out that causing an accident is not (even) considered a crime. I think that would go a bit far, mainly because establishing who is at cause is quite difficult. But I think it’s worth noting: causing damage, and potentially traumatizing, if not physically hurting, innocent bystanders is actually legally sanctioned to that degree. The proven (proven by statistics such as these) risks are accepted or better, ignored by car drivers. On the other hand, if 6. was legally accepted, and the City of Vancouver would have to pay for their share of responsibility in a lot of the accidents, I think it would not be able to afford keeping the streets open. Also, thinking further about this I noticed that car insurance companies are compromised in the sense that for them, the more accidents, the better: more business, more revenue, more stability, more profits. As far as I know, in British Columbia, ICBC is not privately owned and controlled, so that should help working these problems out. You know what? I just realized, there were two other accidents on the other side of the intersection in the last few days. But I came across these when picking up my daughters from school, on the way home, so shortly after 3 o’clock. This is getting a bit much. And 2011 looks even worse for this intersection, because my estimate should be based on higher observation counts. But most of all, I prefer and recommend walking, cycling or taking the bus: that’s what I call civilized. One and a half years later. Things change. I witnessed no more accidents. Didn’t check the statistics though. Writing this post made a difference? Two or three summers ago, we had problems with mice in our house. We have a live trap, sometimes it works. When there are not too many mice, it is quite all right. I usually get the task to empty it, which is not much of a big deal. I take it to a sports field that is half a block away. After opening the trap, the mouse jumps out. The first two times, crows snatched up the mouse pretty quickly. So now I usually stay around for a while, and the mouse manages to disappear in the grass. This time, while I was waiting, a man came by, walking his dog. He asked, so I explained, yes, it’s a mouse trap. He became really angry. i was shocked, because to me it was all really harmless. He asked whether I knew that dogs use the field. He asked if he should call the police. I said yes, since he was pretty intimidating in his anger. Of course, he didn’t. I didn’t know what he was so angry about, I was just glad when he finally left. Funny thing, and I did notice something odd during this confrontation, when I returned home with the trap, I thought to check it, and actually, yes, the mouse had returned to the trap. I took it back right away (Mr. Angry wasn’t around anymore). Later, thinking this over, the only explanation I came up with was that I never mentioned to him that it was a live trap; he may have thought it is a glue trap, or some kind of poison trap. I guess, in his mind, he would not like his dog to sniffle into one of those. So, at the time, using one of those was quite outside of my horizon. At the same time I think a live trap was completely outside of his horizon. Hence the dispute. The live trap didn’t work well enough. After a few months we got an exterminator to help. He was a nice man, and we had a friendly conversation about mice and this and that, so at the end I thought I’d ask him a question that I had been wondering about, especially with the saying in mind, “building a better mouse trap”: What would he think a mouse trap designed by Steve Jobs would look like? Well, no, that’s not who I meant. I think that would be quite a horrible trap. Spreading viruses comes to mind. Quite a while later, I told an acquaintance about the exterminator and the Steve Jobs disconnect. She was super excited about the idea of a mouse trap designed by Steve Jobs himself. She said, it would be so nice and elegant, you would want to put one in every room of your home. In another weak moment I was pondering progress and whether in some sense people have become better, or the world has become better. It’s a huge topic of course, look it up through a Google search, “Is the world improving?” It will show you a lot of pessimism. On the other hand, Noam Chomsky, an unusually harsh critic (which is excellent since he knows and understands so much), said “Slowly, over time, the world is becoming more civilized, in general“. My immediate prompt was seeing all this technology around me, an “iphone” here, SSD memory there, oodles of websites with free photos, people coming up with new stuff like bitcoin, quora, about.me, groklaw.net, some dubstep music. It adds up, and it made me think how fast everything is nowadays, and whether people were really slower in the past. There is no one around coming up with loads of, for example, impressive symphonies or novels anymore, as far as I know. There’s loads of average products that one hears about, like for example, Windows Vista. I think being prolific doesn’t quite mean the same anymore. So it’s not clear cut to me. Now my pondering led me to think about how could one measure this, how could one find an objective answer, how to do a better job at resolving the question. A connection with my personal ongoing tasks of filing tax returns led to this: as you’re probably aware, accountants are updated about all kinds of goings-on in a business. Wouldn’t it be nice if one could look up the “books” of fifty years ago, 25 years ago, and find “the data”. I run a small company, The Buckmaster Institute, Inc, and I can well see how accounting is useful, if only in providing one perspective. Every little piece counts, after all. I can understand the accountant’s approach, I have learned from conversations with some professionals. I know about software and how it is used for accounting. I have recommended against the naive use of spreadsheets (still need to write those stories up). I have personal insights into the amount of effort that goes into accounting. Have you heard about economists talk about “resource allocation”? For example, free markets are declared to be good at “allocating resources efficiently” by to some of those economists. Then this improvement in resource allocation should show up in the “books”, no? In as much as a drop in the efficient allocation of resources would be a sign that the world is getting worse, we might find evidence for the world improving in the financial statements of the businesses of today. Compare the figures to the financial statements from decades ago and we would see whether the world is getting better, maybe only in some small area. But it would be a start. I think you’ll agree it’s not going to work. They very likely didn’t record the right numbers and amounts. Should we call it -1 points for the accountants? Or would you go so far as assessing a full -10 points? What are the recent breakthroughs in the accounting world? Who are the heroes of accounting (what Steven Hawking is to black holes)? Who do young accountants look up to and draw their inspiration from? What are the present “open problems” in accounting? Which obstacles are hindering the full bloom of the profession? Whither accounting: Is there a roadmap? Or is it all just happy-go-lucky? Any hint or pointer would be greatly appreciated! Don’t think your insight might be insignificant. Please don’t think there is a limit on space or time, and we cannot handle all responses. Please help by leaving a comment now. Thanks so much.